This production is personal for Kelley not only because Felder dedicated this work to him, but also because, like Felder, Debussy is one of Kelley’s favorite composers. In addition, one night in June 2017, while Felder was going through his ritual of pre-performance practice alone on stage, he allowed Kelley to observe. Although that particular production was Hershey Felder Beethoven, in the midst of his practice session, he told Kelley he’d been thinking about something and played an exquisite rendition of Clair de lune just for him, foreshadowing what may be to come. 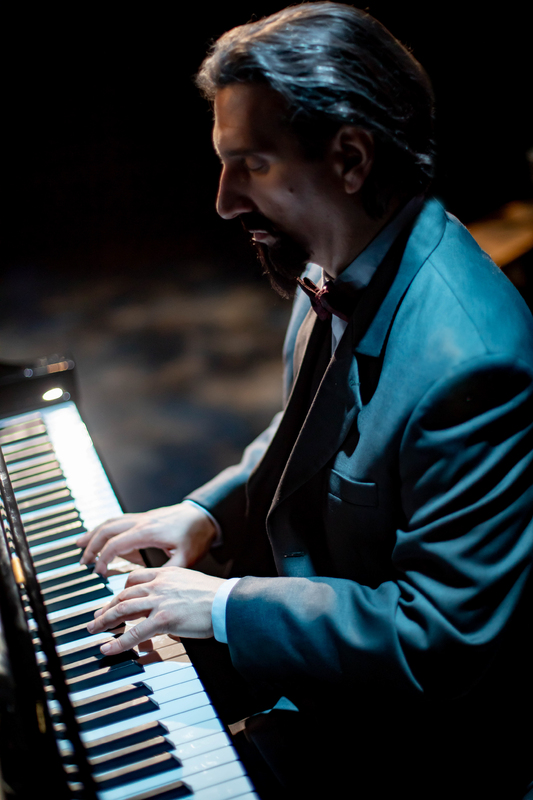 Kelley also studied piano, and throughout his tenure at TheatreWorks he has highlighted the connection between music and drama, often focusing on the piano. Unlike so many of Felder’s previous journeys into various composers’ lives, this latest exploration highlights his deep personal connection with Debussy’s music. Felder has a home in Paris, and in addition to Debussy being one of his favorite composers, Debussy’s music was also Felder’s mother’s favorite. Rather than adopting a character from Debussy’s life at the outset, Felder enters the stage as himself, and much of the story is his own as he recreates his personal quest to understand and experience Paris through Debussy’s eyes. Felder explains that he lost his mother at a young age. Part of his love of Debussy’s music is the result of knowing how important that music was to his mother. He explains that his first visit to Paris took place six years after his mother’s death, in part out of respect for her final wishes. Timing is everything of course, and Felder’s Paris visit begins on the eve of the anniversary of Debussy’s final breath. 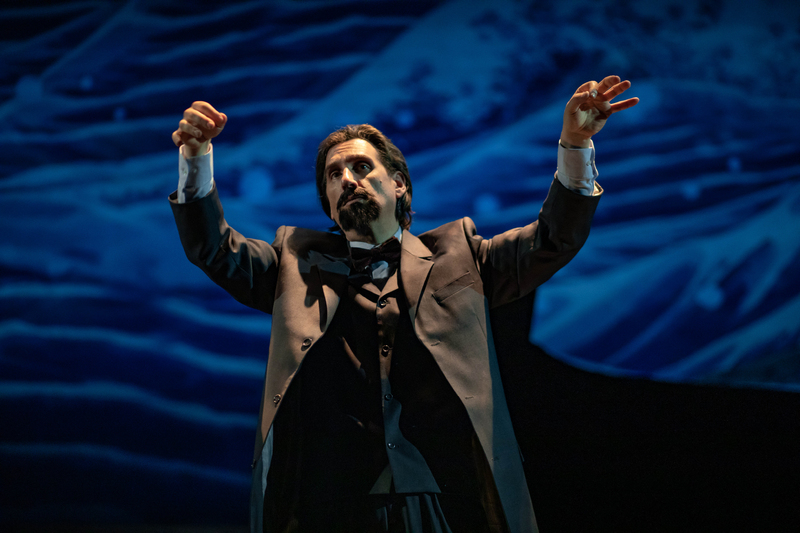 After setting the scene as himself, Felder slides into character and adopts Debussy’s persona as he takes the audience back in time. Throughout the performance, he flips between being himself at 19 and as Debussy recounting his life and times, as always mixing in a wonderful assortment of applicable music. In some brilliantly timed segments, Felder mesmerizes the audience with his storytelling amidst beautiful recordings of various Debussy orchestral works, often edging upstage to the concert grand piano to join in at key moments. Felder also performs an array of Debussy’s piano music to amplify events in the composer’s life. Felder’s story emphasizes his love of Paris and his admiration and astonishment at how Debussy’s music makes him feel. Debussy ushered in the modern era of classical music. His impressionistic compositions don’t so much tell stories as move listeners to feel the music in a new way. Known for tone poems, in many of his orchestral works, such as Prélude à l’après-midi d’un faune or La mer, Debussy’s music brings out the magic of nature. In his piano works, he makes the performer and listener feel the darker influences of the French society of his time. Some of the piano music also shows a unique playfulness as in his Children’s Corner suite, which he dedicated to his daughter. Felder’s set is simple, yet elegant. The piano is upstage center and is flanked by two bridges heading up right and up left. Each bridge is adorned with ornate railings and the characteristic gas lamps that appeared along the streets of Paris in Debussy’s time. As in the previous Felder productions at TheatreWorks, Trevor Hay directs. Christopher Ash provides the lighting and projection design. This time, the projections not only emphasize different Paris landmarks and key natural phenomenon such as falling snow or flocks of birds flying by, they include many more impressionistic combinations of colors and patterns accompanying the music. As always, Felder ends his performance at the piano, this time delivering an iconic piece of Debussy’s music played to perfection. This touching story will enthrall audiences and make them feel the beauty of Debussy’s music, leaving them wanting more. Audience members will get to know Debussy and Felder in unexpected and poignant ways as Felder deftly draws striking parallels between his relationship with his mother and Debussy’s devotion to his daughter “Chouchou,” all the while highlighting a mutual love of this masterful music. See Hershey Felder info, email boxoffice@theatreworks.org, or call (650)463-1960 for more information or to order tickets.